Jack Miller, former curator - Wabash County Historical Museum with permission of Jack Miller. When our new museum opens in Wabash, I plan on being of the first to enter those doors. I will be looking for an old friend, one who stood behind me for twenty years, while I was curator of the old Wabash County Museum in Memorial Hall. Oh, our relationship went back nearly seventy years to 1936. That was the year I made her acquaintance and came to love her radiant beauty and long friendship. Hey, Miller, what the heck! Does your wife, Bea, know about this!? Why of course she does. I have told my wife many times about my love for this old girl. Hey, wait a minute! Are we on the same wave length? Roy never knew from one month to another where the company would send him to fill a vacant trick along that railroad line from Detroit to St. Louis. Well, being a railroad buff, this nineteen- year-old kid felt it an honor Roy stayed with us. I mentioned to him that I would like to learn telegraphy, to be able to shoot Morse Code dots and dashes over the wire. "Hey," he says, "why don't you come down to the deport tonight and sit back there in my office and listen to the soundings. You'll pick it up in no time. The second trick was from 4 p.m. to midnight. I was there at eight o'clock. I was invited to come through that door into the inner sanctum of a deport behind the ticket counter. I hardly noticed her, as she stood silent , and rather cool, there in the passenger waiting room outside. As I look back now, Roy knew what he was doing. I was there every night until midnight. Roy did not have a car, so he could ride home with me up on North Fisher Street. November, 1936 cold arctic air came down with a vengeance. Among the agents' many duties was to keep the depot waiting room above freezing. That is when I first recognized her warmth, her radiant beauty. The weather got colder. First, she had a blush that got to me. l936 was one of the coldest winters in Wabash. By December our girl was red-hot, and she showed it! There was an 11:30 passenger train from Detroit to St. Louis. Every night passengers who paid little attention during the summer gathered around her in that zero weather. Mr. Fisher headed up the American express office which was located just to the west of the old deport. He would come down every night to pull the express wagon with the outgoing express for that 11:30 train. He and Roy had a thing going. About every two weeks Roy would put a pot filled with water, soup beans and a ham bone on the top of the old girl. By 11 o'clock the depot was filled with the aroma of ham and beans. The poor passengers would cry out, "My gosh, does that smell good!" The train had left, the waiting room was empty. Mr. Fisher had locked the incoming express away. It was feast time in the depot's back room. Newspapers were spread on the table, the big onion was sliced, soup was divided into three bowls. Out in the waiting room she smiled at us as she stood there alone. Now, can you blame me for running to see my pot-bellied girl settled in a place of honor in the new Wabash Historical Museum? The greater number of the early residents of Chester Township were farmers but some were not. It is interesting to note the variety of occupations recognized in Helm's History of Wabash County. Jesse Arnold, banker, North Manchester. Mr. Arnold is President of the Manchester Bank, which was established by himself and his brother, John, in 1871. He was born in Darke County, Ohio, October 24, 1831 and is the son of William and Margaret (Folkerth) Arnold. He was reared on a farm and educated in the common school. In March, 1852 he removed to Whitley County, Ind. 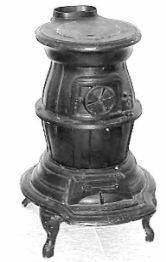 And engaged in mercantile and milling pursuits and still owns large flouring mills in South Whitley and at Huntington, Ind. He was married in October, 1858 to Miss Sarah Thompson… Mr. Arnold is a successful business man and by his integrity has gained the confidence and esteem of all who know him. He was the Representative from Wabash County to the Fifty-first General Assembly of Indiana. Franklin H. Bloomer, M. D. Pleasant View. Born in Fayette County, Ohio, May 6, 1847. His father, Elijah Bloomer, was born in Greene County, Ohio and his mother, whose maiden name was Nancy Hopkins was born in Virginia….Dr. Bloomer was reared on a farm and received a liberal education. He graduated at the Medical College of Ohio, at Cincinnati, and has since been engaged in the practice of medicine with marked success. On the 17th of November, 1875 he was married to Miss Eliza McIlvain, a native of Champaign County, Ohio. In 1877 He located at Pleasant View, Chester Township. He is a member of La Fountaine Masonic Lodge, Wabash Medical Society, and himself and wife are members of the Christian Church. In the fall of 1863 he enlisted in the Seventy-third Ohio Regiment, and took part in the Atlanta campaign and was with Gen Sherman on his march to the sea. He is now very pleasantly located in the village of Pleasant View, and enjoys an extensive, lucrative practice. J. H. Butterbaugh, harness maker, North Manchester, was born in Ohio July 14, 1848 and in 1850 came with his parents to Wabash County, Ind., locating in Chester Township. He learned the harness maker's trade, at which he has ever since been engaged. In 1871 he engaged in business for himself, by an close attention and industry has built up a good trade sufficient to keep three workmen constantly employed. In December, 1873, he was married to Miss Buzzard. Her father, Jacob Buzzard and he mother, Betsey (Aster) Buzzard were both natives of Maryland. Mr. Butterbaugh and wife are members of the German Baptist Church. Benjamin F. Clemans, attorney and Justice of the Peace, North Manchester. Benjamin F. Clemans was born in Preble County, Ohio, December 19, 1843. His parents, Cornelius and Saloma, removed with their family to this county in 1853. During the war, Benjamin enlisted in Company B, Forty-Seventh Indiana Volunteer Regiment and served two years as Quartermaster Sergeant, remaining in the army until the close of the war. On the 10th of June, 1870 he married Miss Emma Benson, who died July 4, 1875. On the 25th of December, 1879, Mr. Clemans married Miss Etta Travelbee. He was elected in the spring of 1878 to the office of Justice of the Peace and the following fall was admitted to the bar, and is now practicing law at North Manchester. He is a member of the Knights of Honor and both himself and wife are members of the Lutheran Church. John J. Cowgill, boot and shoe dealer, North Manchester. John L. son of Benjamin W. and Rebecca Cowgill, was born in Clark County, Ohio, January 18, 1826. When but a boy he learned the shoemaker's trade with his father, who was engaged in that occupartion. He was married in 1843, to Miss Catherine Crill, … In 1845, Mr. Cowgill located in Wabash County, Ind., and in 1852 he left his family here and went to California, where he remained until 1860, returning to Wabash County in that year. In 1862, his wife died and in 1863 he wedded Miss Elizabeth Simpson. … Mr. Cowgill has a first-class boot and shoe establishment in North Manchester, and is a successful and popular business man. J. J. Martin, artist, North Manchester, was born in Ohio June 20, 1841. His father, Samuel Martin, was a native of Pennsylvania, and his mother, who maiden name was Louisa Eckman was a native of Ohio. … Mr. Martin came to Wabash County with his parents at the age of four years and has resided at North Manchester ever since. He served the Union cause as a member of the Forty-seventh Regiment Indiana Volunteers. He participated in the siege of Island No. 10 and was honorably discharged from the service on account of disability. He was married in November, 1866 to Miss Mary E. Williams, native of Indiana and daughter of Clark and Eliza Williams. . . They are both members of the Methodist Episcopal Church. Mr. Martin is a member of the Independent Order of Odd Fellows and the Knights of Honor; recently joined the United Order of Honor and was a member of the Town Council of North Manchester during the year 1881. For the past eighteen years he has been the proprietor of a photograph gallery at North Manchester. He is an extensive dealer in photographer's stock, and carried a large supply of pure chemicals, apparatus, albumen paper, velvet frames, mats, molding, chromos, etc. J. P. Noftzger, marble works, North Manchester, was born in Wayne County, Ohio, May 18, 1839 and came to Wabash County, Ind. In 1842 with his parents, Joseph and Amelia. He acquired a common school education and in young manhood he taught school and, at other time, clerked in stores. In 1867 he was married to Miss Anna C. Carson. … He was elected Trustee of Chester Township in 1878. Prior to this, he owned the bookstore in the post office, but sold out in 1879. He then engaged in the stone and marble trade in which business he is still engaged. He is a member of the Masonic fraternity and also a member of the Knights of Honor. Eli C. Ohmart, M. D. physician, North Manchester, is a son of Joel and Phebe (Frantz) Ohmart and was born May 6, 1859 in Pleasant Township… At the age of fourteen years the subject of this sketch began teaching school. Later he entered the Normal College at Valpariso, Ind. Where he graduated. He also attended the college at Oberlin, Ohio one year. He studied medicine with Dr. Winton and graduated from the medical college at Ann Arbor, Mich... He was married Sept. l, 1878, to Miss Minnie E. Dixson a native of La Porte, Ind.. Dr. Ohmart is the descendant of German ancestors….Dr. Ohmart is very pleasantly situated in the city of North Manchester and enjoys a large and lucrative practice. James Wallace, Postmaster, North Manchester, was born in Randolph County, Ind., June 17, 1850. He is the son of Thomas and Lydia (Cowgill) Wallace. He came to Wabash County with his parents in 1856 and was reared and educated in North Manchester. His father died in 1874; his mother still resides here. Mr. Wallace was appointed Postmaster at North Manchester in May, 1880 by President Hayes, and has discharged the duties of the office with entire satisfaction to the public. J.W. Williams is a prominent druggist and successful business man of North Manchester, Inc. J.W. Williams was born in Clark County, Ohio, February 7, 1824. His paternal grandfather, Enyon Williams was of Welsh descent and moved from North Carolina to Highland County, Ohio during the pioneer days of that section of the country. Enyon William was the father of eight children of whom Peter, the father of J. W. Williams was the oldest. Peter Williams was born in North Carolina and accompanied his parents to Highland County, Ohio, where they died. During the year 1812, Peter Williams was married to Nancy Willis and they had five children, the youngest of whom was John W. J.W. Williams remained in his native county until reaching his thirteenth year, when he came to Wabash County, Ind. And located upon the present site of North Manchester although no town existed there at that time. Mr. Williams received a good common school education and during the years 1839 and 1840 attended a school in the village of Richmond, Ind. Upon his return from school he accepted a position in a general store at North Manchester owned by Asa Beauchamp. In 1856, Mr. Williams began the drug business in North Manchester and has since succeeded in securing a large and lucrative trade. He has always been an energetic business man and although he had a profitable drug trade, during the years 1863 and 1864 he was a partner in a dry goods store in North Manchester owned and conducted by himself and D.B Wendell. From 1866 to 1869 Mr Williams was associated in business with Marshall and Tillman but since the latter firm was dissolved he has given his attention to the sale of drug. Mr. Williams has been twice married. His first marriage occurred in 1844, the bride being Charity J. Kirk, a native of Virginia. They were the parents of five children, only one of whom survives, viz', Jirah Barlow, who has been associated in the drug store with his father since 1872. The first Mrs. Williams having died in 1856, Mr. Williams was again married April 5, 1857 to Miss Elizabeth Kohser, born near Strasburg, Germany, By the latter marriage, they had three children, two of whom survive. Mr. Williams has served in the capacity of Justice of the Peace twelve years and also acted in the capacity of Township Clerk several years. He is a member of the Encampment and I. O. O. F. and has passed all the chairs of the Subordinate Lodge. To none of the many enterprising residents of North Manchester is that city more indebted for substantial encouragement than to J. W. Williams. Through a life of honest industry he has advanced from moderate circumstances to opulence and has dispended his bounty for the improvement of the town and to ameliorate the condition of those to whom fortune had been less kind than to himself instead of hoarding his gains and adding to a fortune already ample. By the course he had pursued in life he had endeared himself to all who know him and his record as a business man, a friend and a Christian gentleman is stamped indelibly upon the memories of all while the advancement of public enterprises, to which he has lent encouragement is felt and appreciated by all his many acquaintances. Since the above was prepared Mr. J. W. Williams has been summoned to surrender the enjoyments of this life. He died of dropsy February 14, 1884. Dr. Horace Winton, physician and surgeon, North Manchester. This gentleman is of Welsh ancestry. His great grandfather, Matthew Winton, was a native of Wales and came to the United States at an early day, locating at Cincinnati, Ohio. He cut a road through the heavy timber which is still known as the "Winton Road." He also erected the first two story house in Cincinnati, and this building was used as a hotel - the first in the town. William R. Winton was the father of the subject of this sketch. He was one of the pioneers of Portland, Fountain Co., Ind. Where he located in 1828, and lived for one year amid the privations of border life. He acted as postmaster at Portland on a weekly salary of $1. He subsequently located at Crawfordsville, Ind. And was one of the first Trustees of Wabash College and one of the most liberal patrons of that institution. He was a very able and successful physician. He removed to Wabash in 1850 and died there in 1873. His wife died in North Manchester in 1884. Dr. Horace Winton, the subject of this sketch was born in Crawfordsville, in June, 1831. In boyhood he was the private pupil of Dr. Thomas, then of Hamilton, Ohio, now deceased. Later he attended Miami University at Oxford, Ohio for two years and completed his educated with a four years' course at Wabash College, Crawfordsville. He read medicine with his father and subsequently attended Rush Medical College, Chicago and Jefferson Medical College, Philadelphia graduating for the latter institution in 1865. He entered upon the practice of his profession at North Manchester in 1856 and has built up a very satisfactory practice in the meantime. He is successful and skillful and has gained the confidence of all. In 1857 he was married to Miss Mary E. Boggs and they are the parents of four children. Both the Doctor and his wife are members of the Methodist Church. He is also a member of the Masonic fraternity, the Independent Order of Odd Fellows, and the Knights of Honor. He has twice filled all the chairs in the Odd Fellows Lodge and was Prelate of his Commandery in the Knight Templars' organization. He is associated with his brother, Dr. Charles Winton, in the practice of his profession. Dr. Charles H. Winton, physician and surgeon, North Manchester was born in Dayton, Ind. July 20, 1814 and is the son of the late Dr. William R. Winton. He was educated in the academy at Wabash, Ind., and Wabash College at Crawfordsville, Ind. Graduating from the latter institution in 1865. He then read medicine with his father at Wabash, Ind., and afterward attended lectures at the Ohio Medical College. He subsequently engaged in the practice with his father and in 1869 located in the neighboring town of North Manchester and entered into partnership with his brother, Dr. Horace Winton. In November, 1868 he was married to Miss Inez Lamoreux. This union was blessed with five children. Dr. Winton and wife are both members of the Lutheran Church and the Doctor is identified with the Masonic fraternity, the Independent Order of Odd Fellows, and the Knights of Honor. As a physician he has been very successful and enjoys the confidence and esteem of the community in which he resides. 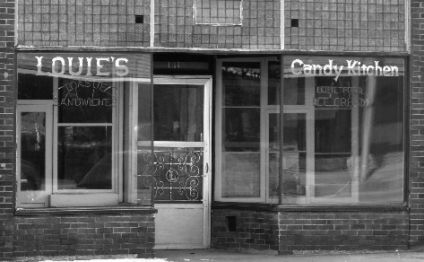 For many people who grew up in Manchester or lived here during important years of their lives recalling Louie's Candy Kitchen brings a special nostalgia. Louie's was a gathering place and a designated driver hurried to Louie's to reserve a booth after the ball game while the crowd gathered. Latecomers didn't get a booth and the place might get so crowded one could hardly move. There was music in the jukebox as long as the nickels lasted and the cheese toasties or the current favorite treat to savor. But as years went by Louie and his wife went to the Lake and Louie's was seldom open. Many College alums always checked hoping to get a well-remembered goodie but were not often lucky. Slowly the building faded into disrepair. More than a year ago the Historical Society tried to persuade Louie to sell the building to them so they could stop the leaking roof from doing more serious damage to the entire building.. Their efforts fell on deaf ears. Once a new roof was on the building, the next task was to restore the upstairs apartment which hasn't been occupied for several years. It was formerly the home of Louie Longo and his wife, but now, in addition to the leaky roof, there were large holes in the walls and many other problems. The Penrods plan to live in the upstairs and they are making that floor larger by extending the back of the building so they can also make space for a garage on the first floor. They also plan a new kitchen and bathrooms on the first floor. Many other challenges await. Cleaning the basement is one already begun. There they found old vinyl records and checks from the 1940's. It is the couple's ambition to restore the old eating place to the original state. The juke box had been sold but another will be among the items to be purchased. The fountain must be replaced but the marble is still intact. Some of the booths have survived and can be refinished; others will be replaced. The old look will be restored; tin ceilings and mirrors on the walls, with lots of woodwork. The early goal was to complete the restoration in three years, but now the Penrod's hedge a bit. But one goal is firm: the motto for the restaurant will be "Where the future is as bright as the past ." They intend to serve some hot food, desserts, coffee, ice cream, of course, and maybe candy. And if we're lucky...all year round. The new owners are adding modern heating, plumbing, new wiring with air conditioning. A final touch will be to redo the facade. But behind it all they intend to have the old Louie's -- better than ever. Kyle Penrod is a graduate of Manchester High School with a degree in finance from IPFW. Kelly graduated from Northfield High School. Both are employed at Steel Dynamics in Whitley County. In June, 1835, at the first session of the County Board, the country was divided into two townships, each one eight miles by twenty-seven, the dividing line being the range line between Ranges 6 and 7. The eastern township was called La Gro, and the western Noble, "in honor" says the Record, "of James Noble, late Senator of the United States from Indiana." Thus the entire west half of Wabash County was Noble, and the whole of the eastern was La Gro. At that time the county (and La Gro Township) had a straight eastern line twenty-four miles in length. The corner now shown as having been taken out of the northeast part of Chester Township was so taken after the creation of Wabash County. It belongs (two square miles) to Whitley County, and, it is to be presumed, was added to the latter county upon its formation which took place after the erection of Chester Township in 1836. The township of La Gro came to its present size and shape by several successive steps, as follows. It was first created June 11, 1835. In May, 1836, Chester was taken eight miles square at the north and Liberty was created eight miles square at the south leaving La Gro also eight miles east and west by eleven miles north and south. At the June term, 1846, the board directed that the line of Liberty and La Gro Townships should be the line between Township 26 and 27, thus cutting off two miles from the north of Liberty and attaching them to La Gro Township, thus making Liberty Township six miles wide north and south and eight miles long east and west. The line between Noble and La Gro Townships was again changed transferring a considerable amount of territory to Noble Township. At some time a mile was cut off from northern La Gro and attached to the south part of Chester. A further change was afterward made, attaching still another portion of La Gro to Noble, taking, altogether, some thirteen sections. La Gro is thus left at the present time (1884) with about eighty-five sections, containing, perhaps, a little less area than Noble, and nineteen sections more than Chester. We used to read that education was a transformation from an inconsistent, incoherent homogeneity to a consistent coherent heterogeneity. We didn't understand that but we have come to the conclusion that education consists of wholesome entertainment and recreation as well as latin paradigms or the value of x. The need of this phase of education has been felt at M. C. for some time and several years ago the students were instrumental in erecting a gymnasium on the campus. Last summer at the annual reunion there was a movement started to add a stage and swimming pools to the present building and have a satisfactory auditorium-gymnasium. This sentiment was backed by an encouraging offering. One day last fall the students, at the suggestion of the faculty, decided to take a holiday by cutting corn, cleaning house, selling kettles and eating dinner in the country and to turn the proceeds into the new Gym Fund. This was an enjoyed success. The various expressional organizations of the school caught the spirit and decided to unite their efforts in an entertainment course the proceeds of which were to BOOST THE GYM FUND. This course consisted of a Music Recital (by the Music department, of course), a Reading Recital by the third year expression class, a joint program by the Majestica. Lincoln and Adelphian societies, an Open Gym. A program, by the Athletic department, "Anita"s Trial," by the expression department, and the play "Between Two Lives" by the Civic and Oratorical League added. The proceeds from the basketball games and quire a few generous pocket-books helped to swell this amount till it has passed the $1,000.00. mark. Everybody is boosting the Gym Fund with enthusiasm and cash. The new stage addition is being stuccoed and inside there will be dressing rooms, at either end and the stage in the middle. The swimming pools will be underneath! Get in the swim! Note; The argument continues; were there ever swimming pool(s) ? at Manchester College.. It's a mystery. •Tour of Amana Colonies with visits of the Woolen Mill, Heritage Center, various shops and dinner at the Ox Yoke Inn. "Fall Extravaganza" including a one day trip to Grand Rapids, MI and the Branson, Mo . Christmas Shows. •Gerald R. Ford Presidential Museum -- 38th President's Cabinet Room, Oval Office etc.